On 5th Nov 1854 at the Battle of Inkerman, Brevet Major Russell, serving with the 3rd Battalion Grenadier Guards, offered to dislodge a party of Russians from the Sandbag Battery if anyone would follow him. Anthony Palmer and another private were the first to volunteer. The Russians put up strong resistance and it looked as if they would all be killed. Palmer shot one of them who was about to bayonet his officer. Russell fought with great valour against a powerful Russian and managed to take his rifle. Russell was born near Reading on 22nd June 1826. He was promoted to Lieutenant-Colonel in 1858 and retired 10 years later. He was Deputy Lieutenant of Berkshire and made Colonel of the Middlesex Volunteers in 1877. He died in Reading on 13th April 1883. 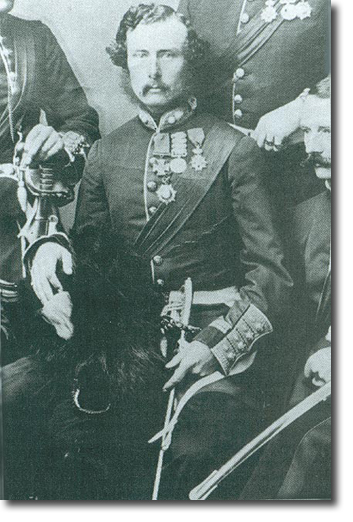 He is sitting here in full dress wearing a post-1857 tunic with rank badges on his collar and officer's sash over his left shoulder.